The Dortmund Christmas markets on 20 December. GERMAN MEDIA AND politicians have warned against an election-year spike in fake news after ultra-conservative website Breitbart claimed a “mob” chanting ‘Allahu Akhbar’ had set fire to a church on New Year’s Eve. 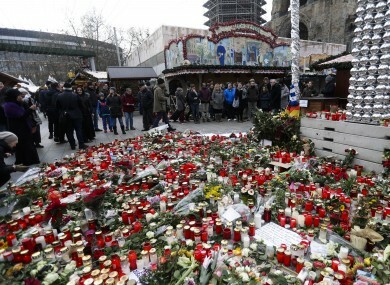 The local newspaper, Ruhr Nachrichten, meanwhile charged that elements of its online reporting on New Year’s Eve had been distorted to produce “fake news, hate and propaganda”. The justice minister of Hesse state, Eva Kuehne-Hoermann, said that “the danger is that these stories spread with incredible speed and take on lives of their own”. Tens of thousands clicked and shared the Breitbart.com story with the headline Revealed: 1,000-Man Mob Attack Police, Set Germany’s Oldest Church Alight on New Year’s Eve. around the flag of al-Qaeda and Islamic State collaborators the ‘Free Syrian Army’. The local newspaper accused Breitbart of combining and exaggerating unconnected incidents to create a picture of chaos and of foreigners celebrating terrorism. Stray fireworks did indeed start a small blaze, but only on netting covering scaffolding on the church, and it was put out after about 12 minutes, it said. The roof was not on fire and the church is not Germany’s oldest. Yesterday Dortmund police said its officers had handled 185 missions that night, sharply down from 421 the previous year. Overall the squad leader had judged the night as “rather average to quiet”, in part thanks to a large police presence. an image of chaotic civil war-like conditions in Germany, caused by Islamist aggressors. misinformation and distortion in order to diminish trust in established institutions. Justice Minister Heiko Maas in mid-December warned that Germany would use its laws against deliberate disinformation, and that freedom of expression does not protect “slander and defamation”. Germany’s top-selling Bild daily also saw more trouble ahead, pointing to the fact Breitbart’s former editor Steve Bannon had been appointed as US president-elect Donald Trump’s chief strategist. It warned that Breitbart – a platform for the so-called “alt-right” movement, with plans to launch German and French language sites – could seek to “aggravate the tense political climate in Germany”. Read: True or false: Did these things actually happen in 2016? Email “Breitbart ran a fake story about a terrorist outrage in Dortmund, and Germans aren't one bit happy”. Feedback on “Breitbart ran a fake story about a terrorist outrage in Dortmund, and Germans aren't one bit happy”.